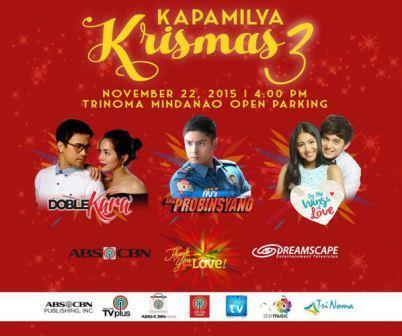 ABS-CBN’s hit teleseryes “Ang Probinsyano,” “On the Wings of Love,” and “Doble Kara” will come together for the first time in bringing happiness and early Christmas treat for fans in “Kapamilya Krismas 3” on November 22 (Sunday) at Trinoma Mindanao Open Parking at 4pm. Don’t miss the cast of “Ang Probinsyano” led by Coco Martin, Richard Yap, Maja Salvador, Agot Isidro, Bella Padilla, Arjo Atayde and Simon Pineda as they give out big Christmas surprises for the fans. The celebration continues as the tandem of James Reid and Nadine Lustre with Albie Casiño and other stars of “On the Wings of Love” bring kilig that will surely draw shrieks from the audience. Also joining the occasion are the stars of Kapamilya Gold series “Doble Kara” led by Julia Montes, Sam Milby, EA Guzman, and Maxene Magalona, which will hype up the Christmas spirit of the Kapamilya viewers. 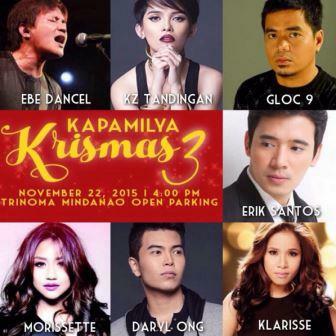 Aside from the stars of the hit Kapamilya teleseryes, the country’s best singers — Gloc-9, Erik Santos, KZ Tandingan, Morissette, Daryl Ong, and Ebe Dancel — will come together in an OPM concert dedicated to the fans.